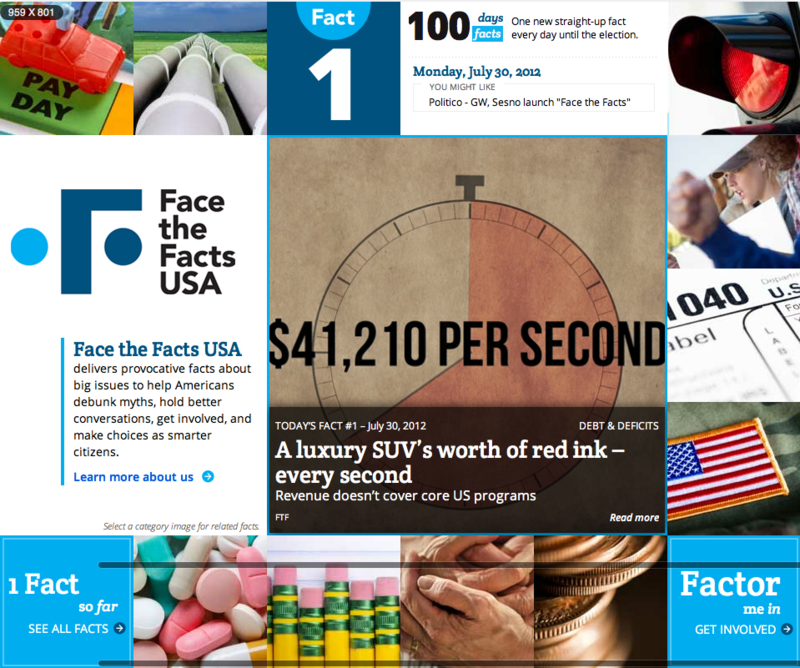 Our Most Recent Launch: Face The Facts USA! This past weekend saw the successful launch of Face The Facts USA, a fact-pushing campaign housed at The George Washington University that will be focusing on bringing greater transparency to issues influencing the 2012 election. Today marked the 100th day before elections and Face the Facts USA promoted it by pushing out their first fact. We here at The Web Development Group are not the only ones to recognize the importance of this website to the general voting population. Since its launch this weekend, both Politico and CNN have covered Face The Facts and discussed its significance to this year’s elections. Promoted as being nonpartisan and a reliable source of information, Face The Facts, a project of The George Washington University’s School of Media and Public Affairs, will send out one issue-related fact daily leading up to the election. The facts themselves will cover ten unique topics that influence our elections, ranging from debt & deficits to national security and health care. Each fact is also accompanied by a corresponding video or infographic. With interaction being a key goal in this campaign, the new website strongly encourages its audience’s engagement. Comments and discussions are welcome on all facts, videos can be uploaded, and, of course, the Face The Facts campaign is active on Twitter and Facebook. From our developers’ standpoint, this website was a challenging and eye-opening project to have implemented. Face the Facts USA combines the best of media and social application that allowed for our team to explore new open-source development tools to best achieve the goals of GWU and Face The Facts USA. Be sure to check out Face The Facts USA and sign up to receive their daily facts! UPDATE: Since posting about Face the Facts USA, yesterday, the site has generated even more media attention. Hailing from Southern California, I was excited when I saw Face the Facts made it in the LA Times! The article gives a breakdown of the purpose of Face the Facts USA. It also has the video from the first fact attached. Other than the LA Times, TIME’s The Page has also picked it up. Titled, The Sea of Sanity, this post described Face the Facts USA as, “a new bipartisan initiative to try get the off-the rails, nearly–substance-free campaign debate back on track with some real facts on big issues.” The daily fact has also been streamed on Mercury News, and Contra Costa Times. Although it is not rare for us to work on a development project that will see a lot of traffic, we are really excited about all the media attention this particular site is getting. Keep checking back to learn about more Face the Facts USA news! And congrats to our amazing development team, you guys rock!